Ready to learn how a tuition assistance program can help your company recruit, retain and develop great talent? We're here to help! Check out this ebook for a roundup of basic and advanced advice. 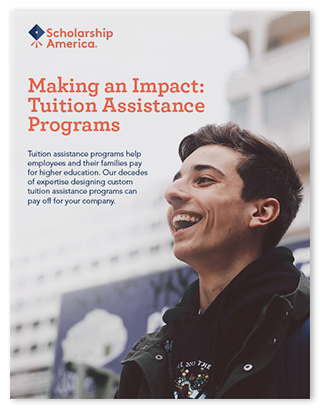 After reading, if you're ready to explore how Scholarship America can boost the impact of your tuition assistance program, we encourage you to get in touch. Our Client Solutions experts in St. Peter, Minnesota are happy to give you free, one-on-one, no obligation guidance. Email clientsolutions@scholarshipamerica.org to get started!